Using Google Chrome is straightforward and the majority of first-time users can get around the browser quickly within no time. Chrome has a simple design and interface, making it easy for users to navigate through pages and tabs. However, browsing in the traditional mouse and keyboard can slow your surfing speed. Thus, learning a few Chrome keyboard shortcuts can save you time and improve your productivity online. Below we have a list of top keyboard shortcuts to enhance your browsing experience in Chrome browser. Related: Google Chrome tips and tricks for beginners. You may be familiar with the “Ctrl + T” to open a new tab but how do you go back to a tab you recently closed. Simply press “Ctrl + Shift + T” on your keyboard. On Chrome Mac, use “Command + T” to open a new tab and “Command + Shift + T” to reopen the recently closed tab. Moving to a specific open tab is a difficult task when you are working on multiple open tabs on the browser. However, you can quickly navigate to a tab by pressing “Ctrl + [1-9]” in Windows and “Command + [1-9]” in Mac for quickly moving to specific open tab. For instance, “Ctrl + 2” will jump to the second tab from the left. This option is only limited to a maximum of 9 open tabs. You can use “Ctrl + Shift + Tab” on both Windows and Mac to move one tab to the left or “Ctrl + Tab” to move one tab to the right. You can use the two options to easily toggle across your open tabs. If you don’t want to leave a trace of your browsing activity, you can switch to “Incognito” mode by clicking the Chrome menu icon at the top-right corner of the browser and select the option. However, you can save some seconds of your time by using the shortcut, “Ctrl + Shift + N” or “Command + Shift + N”. You can use the X mark on the tab or right-click the tab and select the closing option. A faster alternative is to use “Ctrl + W”. Related: Google Chrome Windows Vs Mac versions. When you click on a link on a web page, some will open on a new tab while others open on the active tab. Use these keyboard shortcuts to quickly get the linked opened in the way you want. To ensure that a link opens on a new tab, press and hold the “Ctrl” or “Command” key on your keyboard and click the link. You can also use “Ctrl + Shift” or “Command + Shift” then click the link to open and shift to the new tab. Another important shortcut is to press and hold “Shift” then click a link to open in a new window. Note Chrome has a list of shortcut command URLs you can directly use on the address bar. You can access Chrome settings pages using these URLs instead of navigating through menu. You need to click the Chrome menu icon (3 vertical dots) at the upper-right corner of the browser window to expand the customization and settings options. To simplify the task, you can simply press “F10 + Enter” to highlight the menu icon and expand the menu. Alternatively, “Alt + F” or “Alt +E” to open the Chrome customization options. Use “Ctrl + Shift + B” or “Command + Shift + B” to hide or show the bookmarks bar on Chrome. Learn how to disable bookmarks bar in Google Chrome. Press “Ctrl + Shift + O” in Windows and “Option + Command + B” in macOS to open Chrome bookmarks manager. Traditionally you need to navigate through “Settings > Advanced > Clear browsing data“. To save time you can use “Ctrl + Shift + Del” or “Command + Shift + Del” keys to open the “Clear browsing data” wizard. Learn how to view browsing history in Chrome. You may need to quickly open Chromes downloads. To do so, press the “Ctrl + J” keys in Chrome Windows. On Chrome Mac version, you need to use “Option + Command + L” to open downloads section. Do you know Google Chrome has a task manager similar to Windows Task Manager and Mac Activity Monitor? Open Chrome Task Manager in Windows by pressing “Shift + Esc” keys. Access the browsing history page using “Ctrl + H” keyboard shortcuts in Windows and “Command + Y” shortcuts in Mac. Open Chrome Developer Tools by pressing F12 key or “Ctrl + Shift + J” keys in Windows. Use “Shift + Alt + T” to focus the mouse on the first toolbar item (back arrow) and press tab to move across the items. Press “F6” or “Shift + F6” to focus the element in Windows Chrome. First focus on the item and then press “Shift + F10” to display the right click context menu. You can enlarge or minimize the page content using “Ctrl + +” to zoom in, “Ctrl + -” to zoom out and “Ctrl + 0” to restore the Chrome default zoom. On Mac, use command key instead of control. Chrome is a powerful browser that allows users to exploit the many features and capability to enjoy a great online experience. 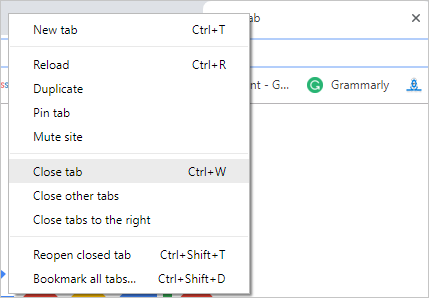 If you want to do much more with Chrome and increase your browsing productivity, you should learn some keyboard shortcuts for Chrome. The list is even longer so keep learning.